The Southern Illinois University Board of Trustees, at its regularly scheduled meeting on the Springfield campus today, approved contracts for SIUE chancellor Randall Pembrook and School of Business Interim Dean Tim Schoenecker. Pembrook becomes SIUE’s ninth chancellor and will assume his new duties Monday, Aug. 1. He takes control from Interim Chancellor Stephen Hansen, who has served since August 2015 following Julie Furst-Bowe’s resignation in June 2015. Pembrook has served as the vice president for academic affairs at Washburn University in Topeka, Kansas since January 2011. He has been the chief academic officer at Washburn working with faculty, staff, students and administrators from the College of Arts and Sciences, Schools of Applied Studies, Business, Law, and Nursing, the Washburn Institute of Technology, Mabee Library/Student Success Center and Academic Outreach. An associate professor of management and marketing in SIUE’s School of Business, Schoenecker takes the leadership reins from John Navin, who resigned at the end of the spring 2016 semester. Schoenecker has agreed to serve for a period of two years to accommodate other leadership changes within the University and retains the option to be a candidate for the permanent position. Schoenecker joined the SIUE faculty in fall 1992 in the Department of Management and Marketing. He previously served as interim dean for the School in 2007 and 2008. 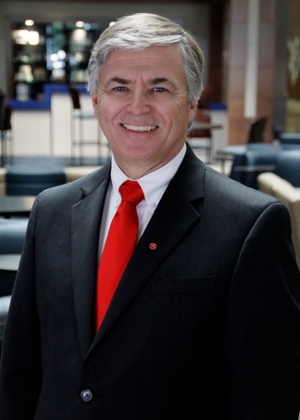 Photo: SIUE Chancellor Randall Pembrook.